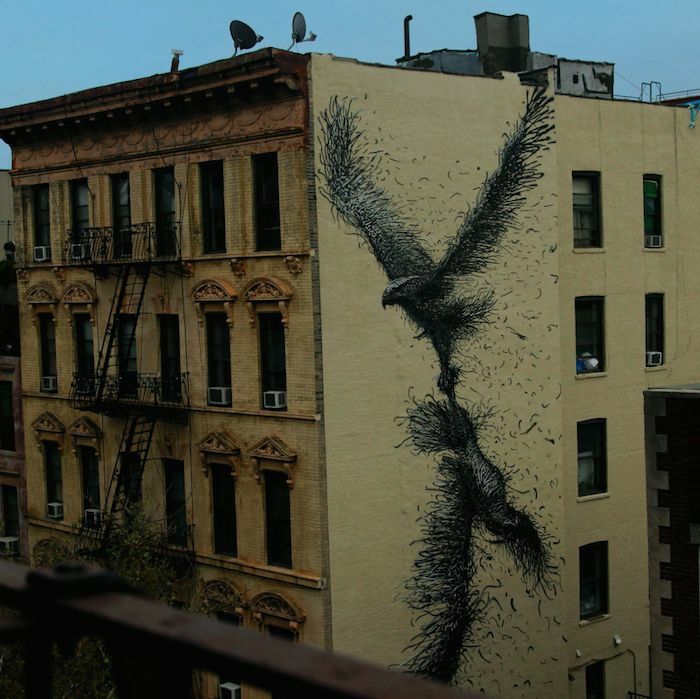 U2 Commissioned Videos from 11 Street Artists; Here's DALeast's Eerie Take on "This is Where You Can Reach Me Now"
New Yorkers: remember when that mural of two ghostly, Cessna-sized birds went up on St. Marks this summer? A new video, set to the song "This is Where You Can Reach Me Now," off U2's iPhone-infiltrating album Songs of Innocence, shows us the mural's creation and the eccentric brains behind it: Chinese-born artist DALeast. He's one of 11 street artists, among them Todd James, D*Face and ROA, who created new work, on camera, to the sounds of U2. (The band conceived the Films of Innocence project based on the political murals that pepper Northern Ireland.) We chose this one because of DALeast's gorgeously haunting mural, and because of the glimpse it offers of New York's dark corners: an abandoned theater, the side streets of Soho at dawn, the skyline from an East Village rooftop. Check out all 11 Films of Innocence here. You can also pounce on tix to U2's iNNOCENCE + eXPERIENCE tour, on sale as of right now.